New Bedford, MA (May 2, 2018) – Cope, the original brand of cable tray, announces a new 5" load depth for its COPE-GLAS™ Cable Tray enhancing the line of existing 2", 4", and 6" depths. Made of permanently bonded continuous glass filament coated with reinforced polyester (or vinyl ester resin) and alternating layers of glass mat, the COPE-GLAS Cable Tray is inherently chemical-resistant. This ability to withstand severely corrosive environments and improved weatherability can extend product life expectancy and dramatically reduce tray installation lifecycle costs. The COPE-GLAS Cable Tray is strong and lightweight, allowing it to be installed quickly and easily. Because there are no sharp edges or burrs, long runs of armored cable can be installed with less chance for cable damage. Each straight section is designed with pre-punched holes to easily accept the splice plate fastener. 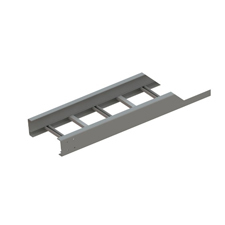 The COPE-GLAS Cable Tray is available in 10' or 20' lengths and meets Underwriters Laboratories Fiberglass Cable Tray Standard UL 568. A standard or special design can be fabricated for any indoor or outdoor application regardless of size. For more information, visit the COPE-GLAS Cable Tray web page here. Cope, part of Atkore International, is an industry leader in cable management solutions and the premier producer of all major categories of cable tray systems. There is a Cope cable management solution for all types of projects and facilities, ranging from standard commercial systems to the heaviest industrial systems. Their high quality and unique features make the Cope product line the preferred choice of installers and facility owners for power and data communication systems. All Cope products are produced to NEMA standards.